Demolishor is the name of several different fictional characters from the Transformers robot superhero franchise. Demolishor, sometimes spelt as Demolisher is one of the earliest created Decepticons of the toyline; and in the storyline, also one of the first to come to Earth from his homeworld - the fictional planet Cybertron. In the Japanese series, Demolishor's name was Ironhide, coincidentally the name of a fellow character from the Transformers series, later Irontread and also later Ironside. Unlike most other Transformers named Demolishor, this character from Revenge of the Fallen turns into a construction vehicle. Demolishor is cowardly when there's no leader, and he isn't the brightest one, but he's powerful enough to fight with multiple foes. He can use his excavator mode's tracks as wheels to travel (either as a unicycle or bicycle) and attack by moving one over his head to crush everything in front of him. Although Demolishor's alternate mode is a construction vehicle, he is not part of the Constructicon subgroup; rather, he is an individual Decepticon who happened to choose a similar guise to Scavenger (who is a Constructicon). Demolishor shares his model with another Decepticon, Scavenger. This led to confusion for several months by fans if Demolishor and Scavenger were the same character or different. In the film Demolishor is depicted as being primarily white, while Scavenger is red, but as Demolishor is seen only at night, his color is hard to see. Additionally most of the toys for Demolishor are incorrectly colored red, like Scavenger, making them nearly identical. 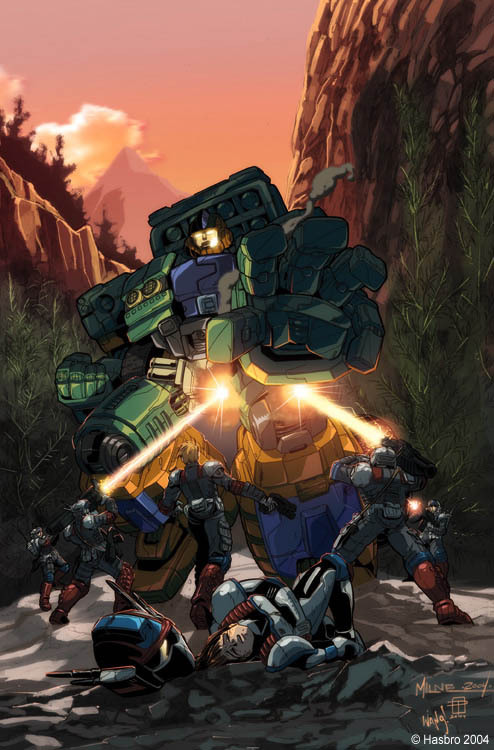 Demolishor was spotlighted in Tales of the Fallen #2. Demolishor had previously massacred an Autobot colony Sideswipe was protecting, leaving Sideswipe alive. Sideswipe pursued Demolishor to Earth. Delighted, Demolishor leads Sideswipe on a destructive chase from Montevideo to Buenos Aires. Demolishor was, however, droven off by the arrival of Optimus and NEST. When the NEST and the Autobots come to Shanghai, China attempting to uncover a hidden Decepticon find Demolishor and Sideways. Demolishor transforms and swats at NEST helicopters as he begins to make himself mobile. Demolishor proceeds on a highway in China. He destroys an overpass just as Optimus Prime transforms and jumps off the bridge. Optimus manages to dive onto Demolishor, grabbing onto his head as he proceeds down the highway. Optimus shoots him repeatedly in the head, while at the same time Ironhide damages one of his wheel joints in which breaks the wheel forcing the Decepticon to fall over, causing him to go off the road and crash. With most of his body damaged as a result, Demolishor's last words are "This is not your planet to rule. The Fallen shall rise again" before Prime kills him by blasting him through the face. ^ Furman, Simon (2004). Transformers The Ultimate Guide. DK Publications. p. 121. ISBN 978-0-7566-3012-6. ^ "Transformers Energon #32 cover". Archived from the original (JPG) on 2007-11-11. ^ "Transformers Energon Armaggedon (Issues 32 and 33) - Transformers News - TFW2005". tfw2005.com. 2010-12-02. Retrieved 6 May 2015. ^ Furman, Simon (2010-11-28). "Energon Archive (4)". Simon Furman the Blog (Wordpress). Retrieved 6 May 2015. In the Mojave Desert, Kicker is fighting Demolishor (re-booted and upgraded by Alpha Quintesson — now one of his agents). At first, Kicker thinks he can handle Demolishor, until that is Demolishor shrugs off Kicker’s energon blast. Clearly, Alpha Quintesson has tailored him for just this mission. ^ S. Trent Troop & Greg Sepelak (2008). Withered Hope. The Transformers Collector’s Club. ^ "First look: Robo-brawlers big, small in new 'Transformers' - USATODAY.com". usatoday.com. ^ "Transformers 2: Super Bowl Teaser is Only The Beginning; Constructicon Details Revealed | /Film". Slashfilm.com. 2009-02-03. Retrieved 2013-07-19. ^ "Cover". Transformers Collectors Club. Fun Publications. April–May 2009. p. 1. ^ "Demolishor in Transformers: Fall of Cybertron". deviantart.com. Furman, Simon (2004). Transformers: The Ultimate Guide. DK Publishing Inc. p. 120. ISBN 1-4053-0461-8. This page was last edited on 27 March 2019, at 22:50 (UTC).